Every year, NFL teams sign marquee free agents at every position while they draft younger players to fill other holes in their roster. Contract language sometimes delays even the most “NFL-ready” rookies while other disputes in contracts take centerstage during the league’s offseason periods (see Sam Darnold, Le’Veon Bell, respectively). Joseph might be entering his 13th season in the league, but he is still a more than capable cornerback in coverage, with PFF coverage grades of 70.0 and above in eight of the past nine seasons. He ranked 44th in the NFL in terms of coverage snaps per reception allowed at 11.6 and 20th in yards per coverage snap allowed at 1.45. Over his career, Joseph has picked off 30 passes and broken up another 103, and hasn’t allowed more than four touchdowns in a season over the past four years. The Texans are fairly protected with the contract too, and if Joseph struggles in 2018, they can cut him ahead of the 2019 season without taking on any dead money. The beauty of the Sherman deal is how little is guaranteed, with just 11 percent of the money locked in. It will be an even better deal for the 49ers if Sherman can regain his pre-injury form, adding a top tier cornerback to a San Francisco roster on the rise. Sherman was dominant in Seattle, allowing a NFL passer rating of 47.7 on throws into his coverage that is the best career mark of any cornerback with at least 300 targets since we began grading in 2006. The concern would be that he doesn’t regain that form coming off the injury, but with the guaranteed money so low, it’s a great contract for the 49ers either way. 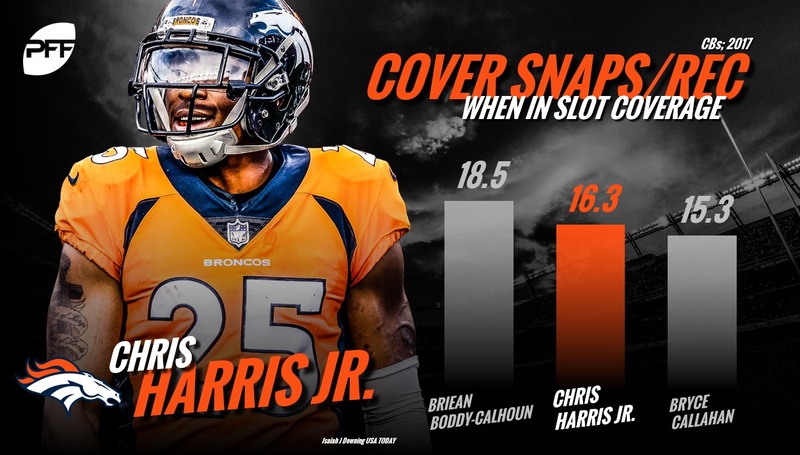 The prototypical slot cornerback on the PFF era, Harris has proven himself both on the inside and outside during his career. It’s on the inside where he has truly dominated though, allowing a reception just once every 16.3 snaps in coverage from the slot in 2017, ranking second among all cornerbacks. Since arriving in the NFL as an undrafted free agent at the beginning of the 2011 season, Harris has allowed just 58.1 percent of passes thrown into his coverage to be caught, including just 15 touchdowns, while he has come away with 16 interceptions and 43 pass breakups. He’s coming off his lowest graded season since his rookie year (79.4 in 2017), but is just a year removed from the second highest graded season of his career (90.4 in 2016), so if he can get close to that form again, the Broncos defense will feel the benefit. An undrafted free agent by the Houston Texans in 2006, Williams has had a fascinating career that has seen lots of ups and down. He returns to Green Bay coming off the second-highest graded season of his career at 81.5, and the highest coverage grade of his career at 83.1. 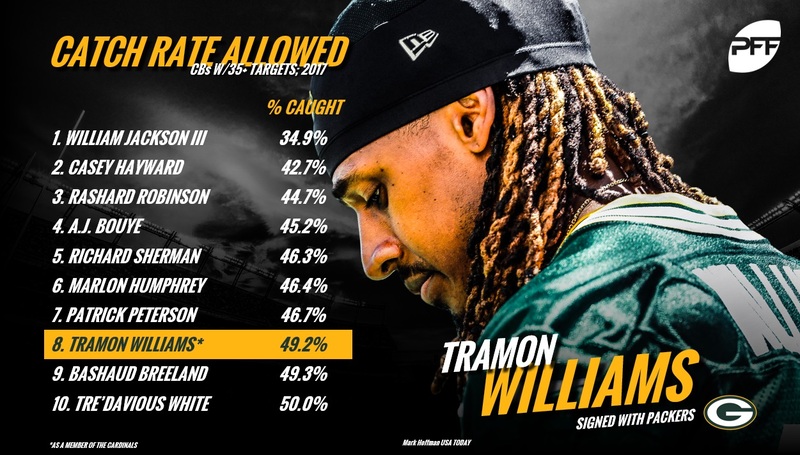 In his best season during his stint with the Cleveland Browns, Williams allowed a reception once every 13.2 snaps in coverage, ranking 24th in the league, while his yards per coverage snap average of 0.86 ranked 21st. He allowed just 351 yards in coverage, and just 49.2 percent on throws into his coverage to be caught, including just one touchdown compared with two interceptions and eight pass breakups. Hayward and the Chargers agreed on a new deal in March, but based on his PFF grade, it’s still a deal that the Chargers should be happy with. He averages the 12th-highest annual salary at the position, but was the best in the league in 2017. 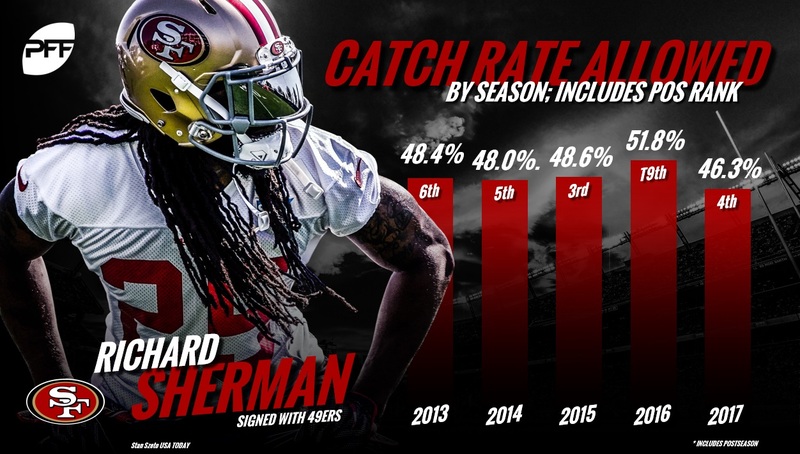 From 75 targets in 2017, he allowed just 32 receptions for a 42.7 percent catch rate. Those 32 receptions went for 537 yards, and with three touchdowns allowed compared for four interceptions and 15 pass breakups, he allowed an NFL passer rating of 58.6 on throws into his coverage. Hayward has long been one of the most undervalued corners in the NFL, and even now that he has been given a new deal, it’s still good value for the team.